Welcome to the vacation of a lifetime, for RIU Jalisco is dishing up the finest resort amenities, cuisines, and most affordable group vacations to Puerto Vallarta. Kick back and relax in one of the huge swimming pools, swim up to the in-water bar and order a drink, or whirl down one of the slick waterslides in the hotel’s own waterpark, but regardless how you choose to spend your day, we promise that a RIU Jalisco all-inclusive vacation is exactly what you’ve been needing! RIU Jalisco in Puerto Vallarta is actually located in the Nuevo Vallarta district of Puerto Vallarta, which happens to be in a quiet district of the area. That’s right, no noisy college students or rowdy nightclubs, this place is all about tranquility and relaxation. As opposed to the resorts in Puerto Vallarta, at RIU Jalisco, you get a beach getaway that simply cannot be compared to the others. Nuevo Vallarta is a much more laid-back vacation destination, surrounded by other enormous resorts and posh vacation homes. Though you may want to relax in the comfort of the RIU Jalisco all-inclusive resort during your vacation, the bustling town of Puerto Vallarta is only a short ride away. The prime location of this resort allows guests to rest during their vacation, but doesn’t limit them from experiencing the action of an exciting beach town.Take a 20 minute cab to the heart of Puerto Vallarta and engulf yourself in the culture, authentic dining, petite shopping, and vivacious nightlife that the town has to offer! As a top-tier resort in Puerto Vallarta, the RIU Jalisco doesn’t just provide upscale attention to amenities, but has also been designed to astonish its guests. The modern, yet natural style of the resort is truly what makes it such an architectural piece of heaven. From when you enter and ascend up the split-staircase to the grand lobby, you begin to see what we mean by “heavenly”. The property in general is completely full of all sorts of enchanting stucco buildings, gazebos, fountains, plazas, statues, and furnishings. Elaborate garden benches and decorated tilings turn your morning walk from a hot and sweaty chore to a joyous event. In addition to the resorts incredible architecture and design, the greenskeepers are unquestionably the best in the business. The impeccable landscape invites guests to wander through emerald green palm trees, bubbling fountains, and fashionable pieces of handcrafted furniture for your personal lounging time. Apart from RIU Jalisco’s incredible design and exterior beauty, the two enormous pools, enjoyable Kid’s pool, and vast untouched beach are quite possibly the resorts strong points. After a calm stroll through the resort’s lavish gardens, you’ll come upon the pristine beach, which offers limitless time to relax. Both of the pools include swim-up bars, so you can soak in the chilled pool as you drink your personalized drink. 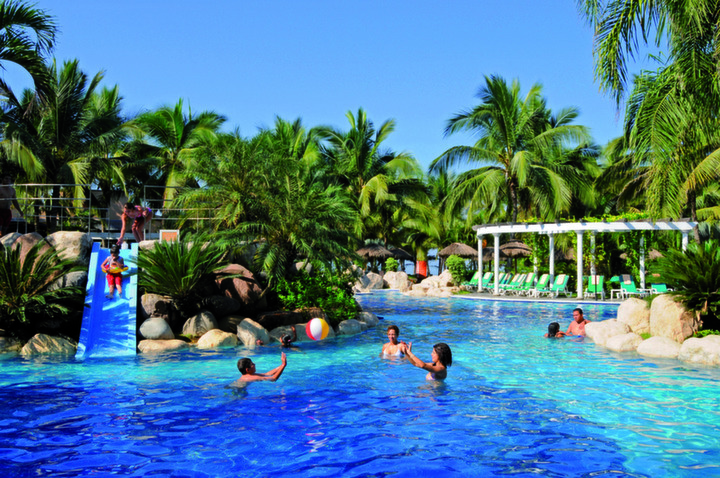 As a family-friendly resort, the RIU Jalisco provides younger children with their own section to enjoy. The kiddie pool is equipped with fountains, slides, and numerous different water type fun for them to enjoy. In addition, the resort includes a spacious fitness center (including cardio machines and weight equipment), rejuvenating spa (with jacuzzi and sauna), two floodlit tennis courts, unlimited use of windsurfing equipment, catamarans, kayaks, and boogie boards, gathering places, a theater, Kids’ club (with outdoor playground), and a variety of bars to choose from. 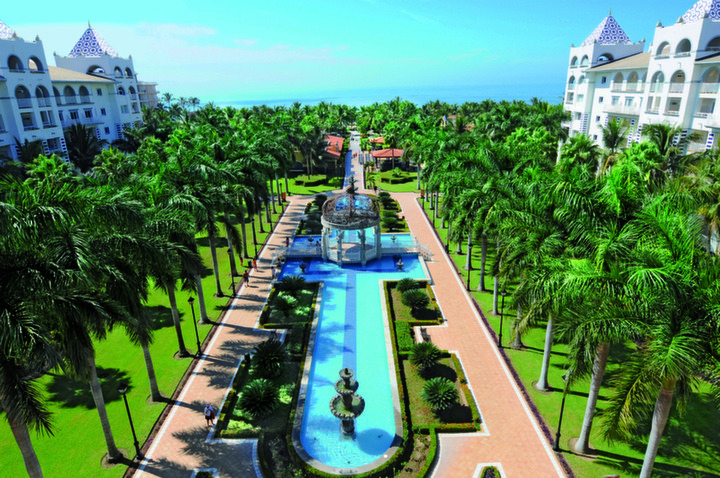 Group vacations to Puerto Vallarta have never been easier, especially considering RIU Jalisco is located next to the RIU Palace Puerto Vallarta. This makes meeting up with friends easy, for guests of RIU resorts receive total use of other RIU resort all-inclusive amenities. What do we mean by all-inclusive? When you book an all-inclusive resort, you get total all-you-can-drink and all-you-can-eat privileges, plus access to all of the resorts amenities. So, if you’d like to take out a boogie board, or you’d like to order a five course meal, it will be covered in your previously determined RIU Jalisco all-inclusive package. With a variety of different packages available, it’s easy to plan group vacations to Puerto Vallarta. 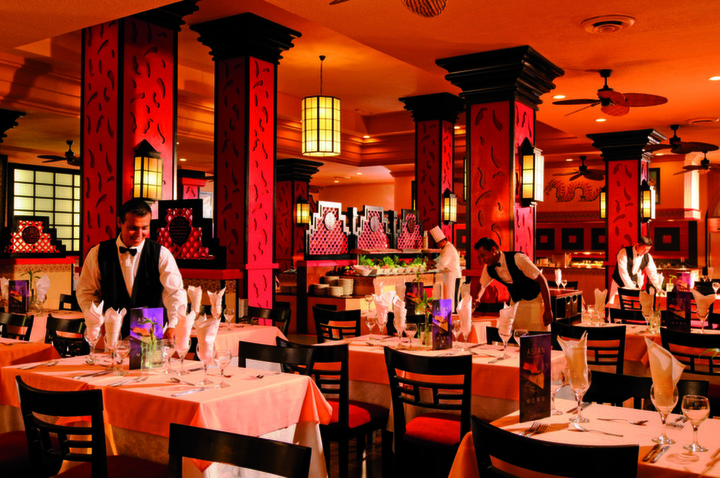 Also, the RIU Jalisco offers eight different food choices, so even the pickiest eater will find something they like. For a Mexican twist, head to Don Emiliano, or if you’d prefer a more casual steakhouse meal, then La Botana can be a great match. Those looking for a more elegant type of dining should consider a reservation at Gran Dragon, Nayarit, or Dona Adelita. Beware that although a lot of these restaurants won’t require a reservation for daytime walk-ins, nights can get a bit busier. So, to make things easier, make sure you reserve a table for dinner. Another great idea for group vacations in Puerto Vallarta is making dinner reservations for large parties. We know you want to enjoy your beach getaway with your closest family and friends, so what better way to enjoy that special time than a classy dinner together? A stay at RIU Jalisco will surely be everything you were looking for during your next vacation to Mexico. 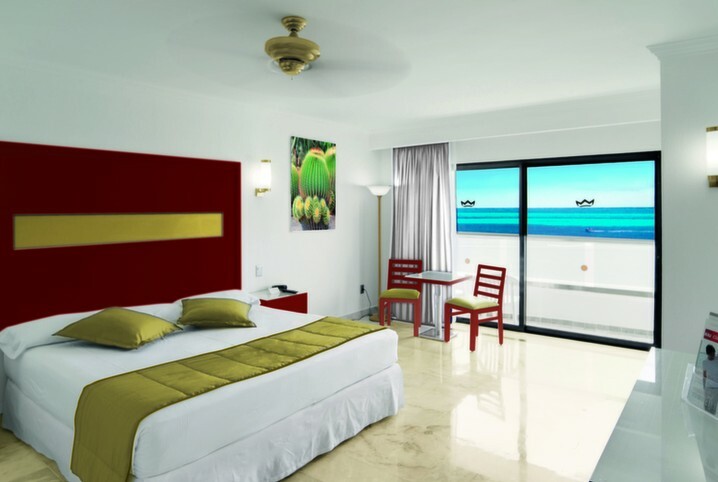 Rooms are spacious here, and provide adequate accommodations for you to enjoy while you stay in paradise. The small, private decks offer incredible views of the water, the mini-bar is restocked daily, and the rooms are always clean. So, if you were hoping to get rest during your vacation, but still want to be close enough to all the action, then the RIU Jalisco will suit you just fine. 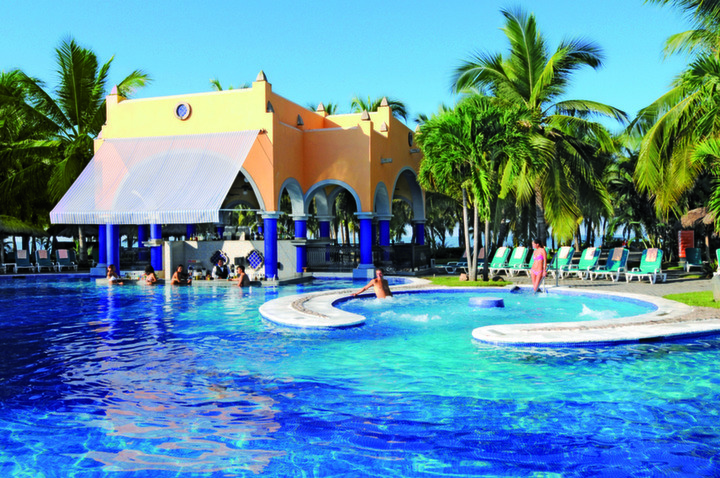 Start searching through our vacation packages today and discover what an RIU Jalisco vacation to do for you!